The number of Russian policemen brought to justice over the past four years is increasing. With people scared of seeing men in uniform, human rights activists and lawmakers in Russia are calling for urgent police reform. The news regarding Moscow police major Denis Yevsyukov, who went on a shooting massacre in a supermarket on April 27 killing three and wounding another six, caused a mass outcry from every sphere of society from common people to top politicians. Regardless, it hasn’t stopped similar incidents from occurring. One of the latest attacks brought to light happened in Nizhny Novgorod, when two policemen brutally beat and tortured local resident Aleksey Yakimov. He applied to the Trans-regional Committee Against Torture and the case was made public. According to Yakimov’s words, it all happened on April 5, when local taxi drivers gathered in Nizhny Novgorod to settle a personal conflict. Yakimov came along to support his friend. Two drunken police officers in plainclothes also appeared at the scene. When Yakimov asked them to show their documents, the men took him to the police department. They later took Yakimov to the Volga River in an attempt to dispose of him. The man survived and was taken to hospital with a broken wrist, torn arm ligaments, numerous other wounds and a concussion. “We double-checked the story through different sources and everything proved to be true,” said the head of the committee Igor Kalyapin in the interview with Russian newspaper Nezavisimaya. Prosecutors are still to launch an official investigation into Yakimov’s case, though the Internal Security Department of the Chief Internal Affairs Administration of Nizhny Novgorod have confirmed Yakimov’s version of the events. The Committee had not seen such a vicious level of torture before, said the human rights defender, but cases of unprovoked and irrational aggression by police servicemen is becoming more and more frequent, says Kalyapin. Just last week a policeman from Nizhny Novgorod was sentenced to three years behind bars for beating Azerbaijani citizen Emil Dadashev in the police department. For merely refusing to light the cop’s cigarette, Dadashev had three of his teeth knocked out and was tortured with a stun gun. It took Dadashev three years to push through his lawsuit against the policeman. “The reason for police violence is that employees of law-enforcement bodies feel themselves free of control and punishment and believe they can do whatever they want,” says Igor Kalyapin. Besides, he says, if a man comes to such organizations for roughly $150, he initially isn’t there for honest reasons. They don’t come to the police for the money, but to get power and weapons,” says Kalyapin. Such impunity is a result of an ineffective investigating process, suggests Maksim Prytkov, a spokesperson for the Committee Against Torture in an interview with RT. “All countries in the world face the problem of crimes committed by policemen. But Russia drags behind other countries in investigating such cases. And this is a problem of investigative authorities. After being involved in a ping-pong game between the authorized bodies, Russian citizens have nothing to do but to apply to the European Court, because they don’t get a fair trial on the national level. And this violates Chapter 13 of the European Convention on Mutual Assistance in Criminal Matters,” says Prytkov. As a result, this helps explain why some police officers feel as though they are outside the law. “I myself am a police officer. I have a gun and can do whatever I want, because I know that the possibility of a criminal case being launched against me and it making to court is, unfortunately, very low,” says Maksim. 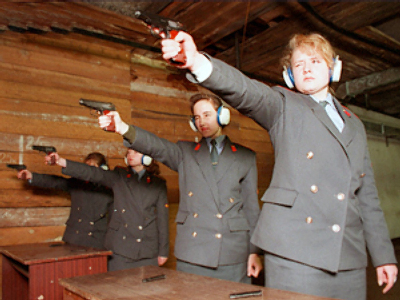 The tempting promise of being able to possess firearms can attract those to serve in the police forces, and in Russia some have no hesitation about using them when off duty. Moscow police major Denis Yevsyukov began his shooting spree shortly after a family dispute, likely motivating him to go on the rampage in the first place. Blood tests showed Yevsyukov had 3.2 permille alcohol concentration in his blood at the time. On average, people with such a high blood alcohol level are at a dangerous risk of slipping into a coma or death, reported Russia’s Komsomolskaya Pravda newspaper. According to the regulations, all police officers are obliged to go through a psychological examination. Policemen say it’s more a formality than a test. The wave of incidents involving policemen isn’t something that comes out of blue and it is a strong signal to start taking immediate action, says Maksim Prytkov. “Perhaps we are getting close to a point when activities within the police system are getting out of control. The system is slowly but, unfortunately, unavoidably degrading. And this needs significant reforms to be implemented,” says Prytkov. The core of the problem lies in the hands of those who are responsible for the human resources department of Russia’s police, said Anatoly Kucherena, the head of Public Chamber’s Committee for controlling activities of law-enforcement bodies and reforming juridical system in Russia, speaking with RT. “This problem has a lot to do with psychological matters, because we are aware of situations when a man puts on a police uniform and feels himself like an all-mighty ruler. But we also aware of bona fide policemen who do their duties properly,” says Kucherena. This is a sign that a thorough inspection must be carried out urgently, adds Kucherena, in order to understand what is going on in the national police system and why citizens are often scared to see a man in police uniform. “We don’t need such police. We’d be better off short of staff, but we need quality, we need employees who will be fair workers and that their actions will defend citizens’ interests,” said Kucherena. Russia's Internal Minister Rashid Nurgaliev will personally monitor the criminal case opened against Denis Yevsyukov who was police chief of Tsaritsyno district in Moscow. Nurgaliev has also ordered to carry out a large-scale inspection of staff in bodies of the Internal Ministry. "It refers to its recruitment, studying morale and the psychological climate in the working environment, and, certainly, the transition from so-called paper resumes to proper human evaluation and dialogue with potential candidates for internal affairs agencies," says the statement released on the ministry’s official website. Official figures of crimes committed by police seem to more enthusiastic. In 2008, the number of registered crimes reduced by 10%, said Yury Dragunov, the head of the Internal Security department of the Internal Ministry, in the interview with Russia’s Rossiyskaya Gazeta in March, though he admitted that the tendency of the growing numbers of cops brought to justice is up since 2005. However, the problem in the system still exists. 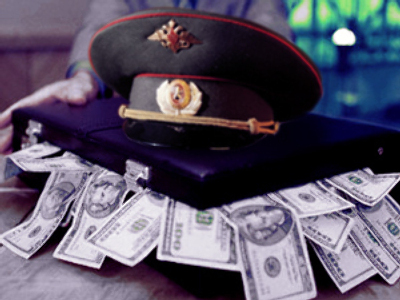 Most of the Russian officials jailed on corruption charges in 2008 were working for the police. Meanwhile, opinion polls show that less than one third of Russians trust the police. The survey, conducted by the Research Centre on the website www.superjob.ru on the eve of ‘Police Day' in November 2008 showed that only 2% of respondents fully trust the law-enforcement bodies. The majority of that 2% was made up of current or former police officers. What to do if you meet a mad cop? The number one piece of advice is: do not provoke an argument. “Policemen are also human. Moreover they are stressed and stressed permanently. If they demand anything, you’d better obey. Any action that can throw a cop off balance can eventually turn against you,” says Maksim Prytkov. A person should try their best to persuade a cop to be good, says Anatoly Kucherena, but admits that sometimes life is more valuable than a fight for fairness. “It’s easy for me to say ‘persuade a cop to avoid illegal deeds’ being head of a Public Chamber Committee because I know some people who paid a high price for teaching policemen what’s good and what’s bad,” adds Kucherena. – report to police/human rights groups/public committees. Both say one shouldn’t draw a curtain over the incidents. If faced with senseless assault by the police, apply to law-enforcement bodies, get medical sheets confirming all injuries and fight for your rights, and don’t keep silent.